View More In Blood Glucose Monitors - Page 3. 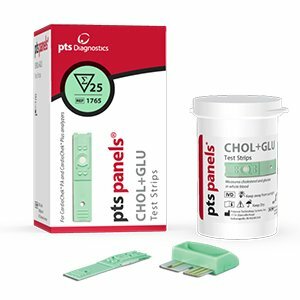 25 Cholesterol+Glucose test strips for CardioChek PA only and are ideal for public health screening environments as well as personal use. This combination test cuts the screener`s testing time in half and requires ONLY ONE DROP OF BLOOD. If you have any questions about this product by CardioChek, contact us by completing and submitting the form below. If you are looking for a specif part number, please include it with your message.